John Smith, a Salinas, KS businessman, desired to provide a tornado safe room for his employees, suppliers, and occasional office visitors to protect them from tornadoes which frequently threatened his manufacturing business on the outskirts of Salinas. Smith was very conscientious about providing a professionally designed tornado shelter for these people. So, he employed the services of an architectural/engineering firm to design the tornado shelter to meet national storm shelter standards and comply with local building codes. He desired that the storm shelter be constructed of non-combustible materials and be located inside the metal plant building envelope as close to the office personnel and plant workers as possible and that, if at all possible, that the tornado safe room be anchored to the existing 6” thick steel-reinforced concrete plant floor. Smith specified that the safe room was to double as a break room and restroom area which could be quickly accessed by all employees and visitors to the plant in the event of a tornado. Smith was adamant that he did not want anyone having to go outside in threatening weather to get to the safe room, as this could result in litigation if someone was injured by having to run through hail, lightning, and wind-driven debris to get to the tornado shelter. A week or so later Mr. Smith was called by the engineer to discuss a design consideration which was seriously affecting the originally estimated cost of the storm shelter. The engineer informed Smith that he had submitted a shelter design, complying with ICC 500, ICC/NSSA Standard for the Design and Construction of Storm Shelters, to the Salinas Building Department and was informed that the tornado shelter would have to have a two-hour fire separation from the rest of the manufacturing plant, or that the shelter would have to be constructed outside the manufacturing plant as a separate building. Further, due to the requirement for fire separation and uninterrupted ventilation for shelter occupants, keeping the storm shelter under the roof of the manufacturing plant would increase the shelter cost from the originally estimated $40,000 to about five times that amount. Smith decided to shelve the idea of protecting his workers and visitors from tornados. This is a sad story which is being repeated in many places throughout the United States. Tornado shelters inside host buildings, which are the most accessible and economically feasible types of storm shelter, are frequently being viewed as cost-prohibitive due to misinterpretation of ICC 500, Section 601.1, Fire separation, by many design professionals and building officials. Teressa Lanquist operates a high class jewelry and specialty dress shop in Georgetown, TX. Many of her customers come to her store from as far as Denver and Memphis. She has developed strong personal bonds with her customers which has made her store a favorite shopping place for many women throughout the southern tier states. The Lanquists previously had their home outfitted with an in-residence tornado safe room which was designed in accordance with the ICC 500 storm shelter standard and FEMA P-320. This tornado safe room was large enough to accommodate the Lanquist family with room for a couch, two chase lounges, TV, and a table. Mrs. Lanquist decided that this same tornado shelter would be ideal for protecting their store employees and the small number of store customers who would be in the store at any one time, and the shelter space could also be used as a dressing area having a restroom. Due to the frequency of tornadoes in the Georgetown area, she reasoned that having a tornado safe room in her store would show her concern for the safety of her customers and enhance the reputation of her business. She would also be able to use the tornado shelter for securing valuable items after store hours. She contacted the storm shelter manufacturer to see if the same tornado safe room design could be used for her store. She was informed that the shelter would be a community safe room and that, according to ICC 500, the shelter walls and ceiling would have to have a two-hour fire separation from other areas of the store. Consequently, the passive ventilation required by ICC 500 would not be feasible because venting through the walls and roof would not be feasible. Thoroughly discouraged by this news, Mrs. Lanquist abandoned the idea of having a tornado safe room in her business. In October, 2015, this author, as a Producer Member of the ICC Storm Shelter Committee (IS-STM), submitted a Request for Interpretation of ICC 500, Section 601.1 to the IS-STM committee in order to get this issue resolved for the public. The board of directors of the National Storm Shelter Association (NSSA) weighed in on this matter with a board resolution stating that interpreting Section 601.1 as an absolute requirement for a mandatory 2-hour fire separation of storm shelters from host buildings would impose “an unnecessary, harmful, and statistically unsubstantiated requirement upon the storm shelter industry which produces and/or constructs ICC-compliant community storm shelters within host buildings.” The Request for Interpretation remained un-resolved after consideration by the IS-STM committee. Larry Tanner, manager of the Debris Impact Facility at the National Wind Institute, has conducted post-storm investigations for hundreds of tornadoes and hurricanes in the United States. During these investigations he has found only one case where a fire resulted from a tornado. That fire was caused by a broken gas line and a first responder smoking. The approximately 211 Alabama tornadoes of 2011, which resulted in some 337 deaths, were widely covered in the news media and internet reports. There are no reports of tornado-induced fires, or deaths or injuries from fires following tornado strikes, The Joplin Globe cited an incident wherein a house fire resulted several days after the May 11, 2011 Joplin, MO tornado in which candles for lighting accidently set a fire. No other fires were reported which can be directly attributed to this destructive, widespread EF-5 tornado. The report of a combined NIST/NOAA research task group which conducted the “May 22, 2011 Joplin MO Tornado Study” , led by IS-STM committee member, Dr. Marc Levitan, presented the following summary conclusion in “Wind Design Context for Tornadoes” with reference to national codes, standards, and practices related to life safety in tornadoes. This task group, consisting of four nationally and internationally renowned tornado researchers, was tasked with producing a technical basis for cost-effective changes in national codes, standards, and practices for buildings and storm shelters to mitigate damage and reduce deaths and injuries resulting from tornadoes. During initial deliberation of this subject, the IS-STM committee took the position that “The likelihood of a fire occurring simultaneous with a major natural disaster such as earthquakes or hurricanes is very low, and, historically, these events are always considered separately in a design.” Dr. Levitan concluded that Section 601.1 Fire separation does not require a 2-hour fire separation, but only requires that, when separation barriers/assemblies are required by the International Building Code, they must be 2-hour rated. What can be done to solve this problem? It is imperative that the fire safety provisions of ICC 500 be revisited by the next-convened IS-STM committee of the International Codes Council to eliminate the ambiguity which is leading many ICC 500 standard users to interpret Section 601.1 as requiring unconditional 2-hour fire separation of storm shelter space from other occupancies in host buildings. This author suggests that resolution would be best accomplished by the IS-STM committee in consultation with the International Codes Council – IBC Committee and the IBC Fire Safety Code Committee. It makes no sense for one ICC standard to require construction which is made unlawful or infeasible by the requirements of another ICC standard. Failure of the IS-STM committee to properly deal with this critical issue will result in continued confusion and a continuing lack of interest of business owners and facilities managers in providing tornado protection for employees and customers, as well as patients, residents, students, and others. It will continue to have a serious negative effect on protecting the public from severe weather events such as tornadoes. Reduced travel time to shelters (quick access for short-notice tornadoes). Occupants are not directly exposed to extreme weather conditions (large hail, lightning, wind-driven debris) while entering or leaving the tornado safe room. Shelter space can be used for other activities when not occupied as a tornado shelter. Building setback requirements may not permit sufficient space for safe rooms to be constructed outside of a host building. Granting authorities, insurers, zoning ordinances, or company policies may require a tornado safe room to be within the host building. Host building weather protection in the interior of the building during normal weather conditions reduces tornado safe room construction costs. Host building floor slabs may qualify as foundations for above ground safe rooms. Business may need to maintain proprietary information in a tornado safe room inside the host building. Business may desire that the tornado safe room protect IT or other vital business functions from tornado damage inside the host building. Business may desire to limit occupancy of the tornado safe room to its personnel and customers. Business may desire to conceal the existence of the storm shelter on its premises. Conditions of safe room occupants or attached life support equipment may require that safe rooms be internal to the facility host building. Possible legal requirements for safe room occupants to remain within a facility host building (airline passengers, prisoners, mental patients, small children, etc.). Occupants of a prefabricated metal building would be at risk of serious injury or death from lethal, wind-driven metal cladding torn from the building by a tornado while they are attempting to access a tornado shelter outside of the building. The names, businesses, and places used in this article are fictitious. 2015 International Building Code, International Code Council, Inc., 2015. ICC 500-2014 Standard and Commentary, ICC/NSSA Standard for the Design and Construction of Storm Shelters. Design and Construction Guidance for Community Safe Rooms, FEMA Publication P-361, Second Edition, August 2008. Email from Larry Tanner to James Waller, dated June 25, 2012. Mitigation Assessment Team Report, Tornado Outbreak of 2011 in Alabama, Georgia, Mississippi, Tennessee, and Missouri, Recommendations of the 2011 Tornado MAT. “Candle blamed for house fire; no injuries cited”, The Joplin Globe, May 30, 2011, http://www.joplinglobe.com/crime_and_courts/x1561295452/Candle-blamed-for-house-fire-no-injuries-cited. Levitan, M., “Draft Study Plan and Research Overview” (Briefing for NCST Advisory Committee), NWIRP Research and Development Program, November 7, 2011. 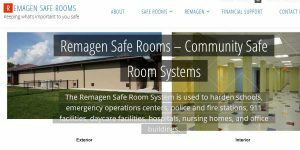 Remagen Announces Retrofit Safe Room Systems to Harden against School Shootings and Tornadoes. ©1997 - 2018 RemagenSafeRooms.com. All Rights Reserved.